And was the answer clear? Did Nature show you where/how to go? I don't know. I guess Nature's answer is not always immediate or clear, but I know when it comes it will be. tracy j, I think that the map speaks of the interconnectedness of everything in creation. It reminds us that we are already everywhere and part of everything. 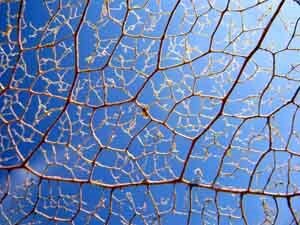 As long as we respect these connections of smaller veins weaving webs between the greater web of thicker veins that form the leaf that is part of the crown that breathes and nourishes and shelters, we'll all find our natural places in this world.